The brutal murder of journalist Jamal Khashoggi has now brought the bloody war in Yemen into the spotlight of the mainstream media. At the end of his presidency, Barack Obama had sold more weapons than any other US president since World War II. According to a Congressional Research Service report published just before Obama exited office, the Obama administration sold over $200 billion worth of weapons, mostly to the Middle East. The prime benefactor of this relentless warmongering transactional relationship was of course Saudi Arabia, whose pending delivery of equipment and specialised training for troops exceeded $115 billion. Nearly 10% of US arms exports between 2011 and 2015 were sent to Saudi Arabia and a further 9.1% went to the UAE; two countries that have exacted a whirlwind of death and destruction upon Yemen, the Arab world’s poorest country. In an overlooked interview, Rob Malley, President of the International Crisis Group and former Special Assistant to President Obama, revealed that the war in Yemen only went ahead with the Obama administration’s approval. Malley also revealed that the reasoning behind Obama’s support for the war had nothing to do with humanitarian concerns; it was simply about appeasing the Saudi leadership in its quest to confront potential Iranian expansion. The brutal murder of Washington Post journalist Jamal Khashoggi has now brought the bloody war in Yemen into the spotlight of the mainstream media. While for years the corporate media pretended that Yemen’s death toll would remain unchanged at 10,000 (only then to reduce below 10,000 periodically) it is now being openly reported that just from starvation alone, Saudi Arabia’s blockade has killed some 85,000 children. But why did it take the murder of Khashoggi for the media and prominent politicians to begin openly talking about ending America’s relationship with Saudi Arabia? The war in Yemen has only taken place and unleashed the scale of destruction it has with the full support of the US and the UK. Even without its vast list of war crimes, Saudi Arabia’s record of human rights abuses and executing anyone and everyone it sees fit has been known to the media and the public for years. Saudi Arabia has one of the highest execution rates in the world. The Kingdom openly executes political dissidents and its western allies barely blink. Just recently, it had a secretive court decide whether or not to execute a women’s rights activist. Even after Khashoggi’s death and the resulting outrage, the Saudi leadership continues to torture and kill journalists, but because these victims have no known link to the Washington Post, we are simply not told about it. This is the background reading necessary to understand Donald Trump’s continued support of Saudi Crown Prince Mohammad bin Salman (MbS) and why the US will continue to stand by its Saudi ally. Even if the Central Intelligence Agency (CIA) does indeed have a plan to oust MbS and replace him with someone less friendly towards Washington’s adversaries, such as Russia, don’t expect the humanitarian aspect of this relationship to change – or even be on the table to begin with. Obama gave Saudi Arabia the green light to start a criminal war in Yemen, supplied them with all the military equipment needed to do so, and provided them with all manner of support in the process, including, for example, sitting in the command and control centre, refuelling planes and providing lists of targets. Let’s not forget that when a Yemeni journalist exposed Obama’s secret drone-bombing of Yemen and was subsequently locked away, Obama personally called Yemen’s President Ali Abdullah Saleh to express his “concern” over the journalist’s planned release from prison. Talk about Washington’s commitment towards protecting journalists from dictatorships. It is not that Trump has changed anything meaningful about the way America manages its relationships and foreign policy strategies – it is just that Trump has brought this horrifying truth out into the open. Trump’s insistence that the US forget about what Saudi Arabia has done and focus instead on the menace that is Iran, as well as the economic opportunities that Saudi Arabia presents (not to mention the very real threat that faces the US if it abandons its relationship with Saudi Arabia, only for the Kingdom to turn towards the open embrace of Russia and China) is just putting in plain and simple terms what the US war machine has been doing all along. “The United States intends to remain a steadfast partner of Saudi Arabia to ensure the interests of our country, Israel and all other partners in the region,” the president wrote in his White House press statement. This one sentence alone will remain unchanged, be it Obama, Clinton, Trump or Kanye West sitting in the Oval Office. 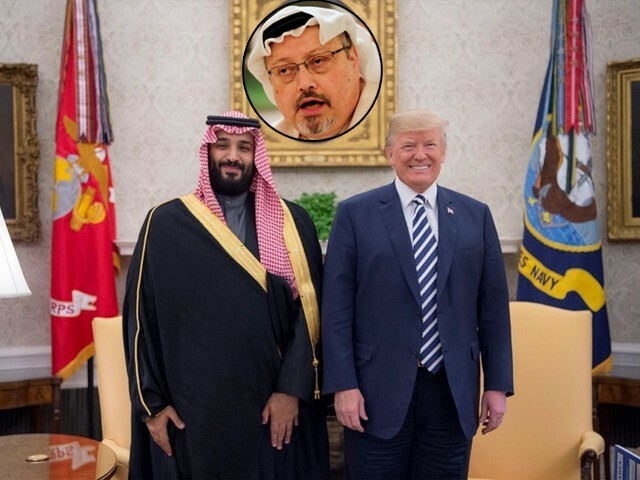 This is why Trump will not hold MbS accountable for his apparent role in Khashoggi’s murder, and it is the same reason why Obama empowered MbS to become the tyrant he is in the first place. Money makes the world go around. Until Saudi Arabia runs out of oil and money, the world will keep going around in a never-ending cycle of bloodshed, the same way it has been for years. All that conglomeration of nations, that help each other, even if they are capable of mass murder, of provoking famines, miseries that seem like holocausts. When they sell the tyrants war material, bombs, etc., they become the blind, the deaf. And neither see nor hear. Or yes, they see and hear. But they are indifferent, insensitive. Since they are addicted to a way of life, which generates so much evil, misery. We cannot do anything, against that way of living. But yes, we can do something about it, in our way of living, in every act, in every word, in the facts. Since all that -our way of living- is going to affect all of humanity.